America’s freshwater issues will not be solved one river at a time. That’s why The Freshwater Trust (TFT) does not only work on the ground fixing individual basins of the West. We’re also behind the scenes, developing solutions that are scalable and meaningful to many in the world of water. Think of us as not only dirt workers but developers. Implementers but also innovators. TFT has built a patented toolkit for assessing watersheds, prioritizing restoration actions, and monitoring progress over time. The BasinScout Methodology: Watershed and site level assessment to identify conservation opportunities and quantify their benefits. DIET: The Dynamic Implementation Environment Tool: Generating insight with an optimization algorithm to balance multiple conservation objectives. 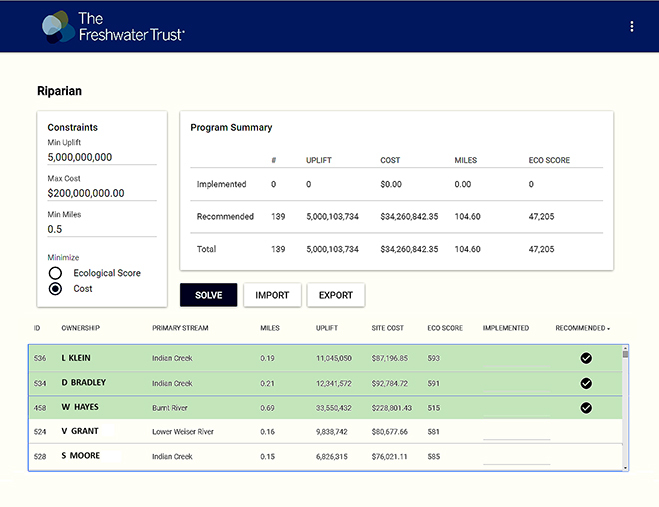 StreamBank Monitoring Application and Tracking Tool: Online monitoring and tracking to assess program progress over time. Together, these tools provide us with critical insight and an efficient strategy for directly addressing limiting factors and meeting ecological objectives. Sediment, nitrogen and phosphorus from runoff impede the quality of rivers across the country. The simplification of landscapes and removal of streamside vegetation has left habitat inhospitable for native species. Overuse has led to once-plentiful streams disappearing. Wildlife, communities and economies have suffered as a consequence. With this toolkit, we’re able to plan, implement, and monitor robust restoration and conservation programs that match the pace and scale of problems and offer stakeholders an efficient and holistic way of mitigating impacts and better managing the resource. Thanks to improvements in remote sensing and satellite imagery, we now have the resolution we need to see an entire watershed. Our BasinScout methodology combines this imagery with publicly available data sets to identify project sites with the greatest “uplift” potential. This term has been coined to describe a site’s potential environmental benefit based on pre-project and post-project conditions. More simply, it’s the amount of environmental good that can be done in a single place. For example, with information on existing streamside vegetation and solar radiation, BasinScout can identify the best places to plant trees to generate shade. 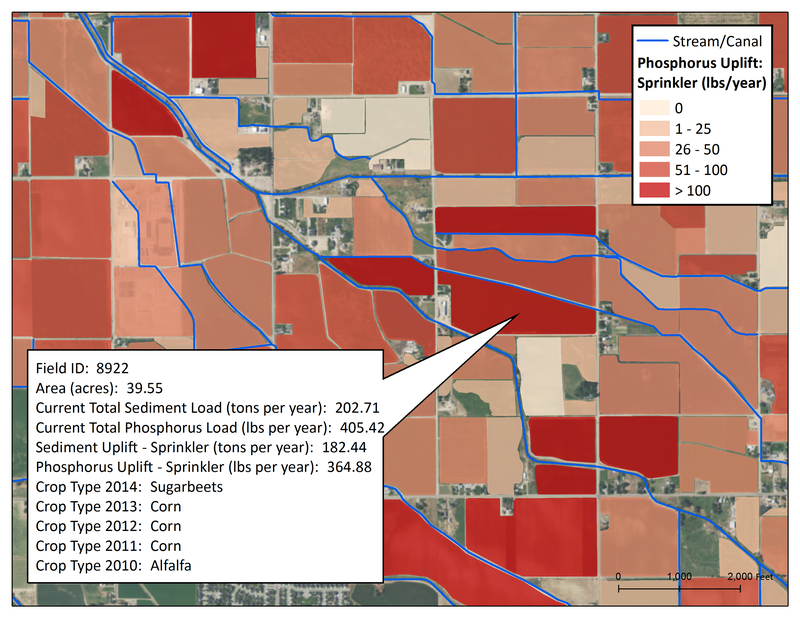 Publicly available data on soil type, slope, and crops grown are inputs we use to assess where to implement agricultural best management practices. For instance, actions such as installing fences to keep livestock out of a river, upgrading irrigation systems, or planting cover crops on select parcels of land can reduce agricultural runoff, keeping fertilizers and manure out of the stream. These added nutrients otherwise lead to the eutrophication of aquatic systems, resulting in algal blooms and hypoxic zones (areas absent of oxygen). Using the BasinScout methodology we can identify the largest potential sources in a watershed and help to direct the actions where they are most needed to address the impacts. To protect water quantity instream, we evaluate water rights data in the context of the stream network and its natural flows; we can determine which properties would be best to contract with on a water use agreement. Selected farmers and ranchers who choose to participate can then be financially compensated for keeping water in the river where and when it’s needed most. Ecological limiting factors: What are the environmental needs within the watershed? Regulatory review: What are the regulatory requirements and policies for the watershed? Disturbance: What is the current state of riparian health across the watershed? What are the current agricultural practices that are impacting water quality or quantity? Change: What restoration or conservation has already occurred and what change in ecological health can be tracked? Goals and requirements: What are the water quality and quantity improvement targets for the watershed? What will it take to get there? 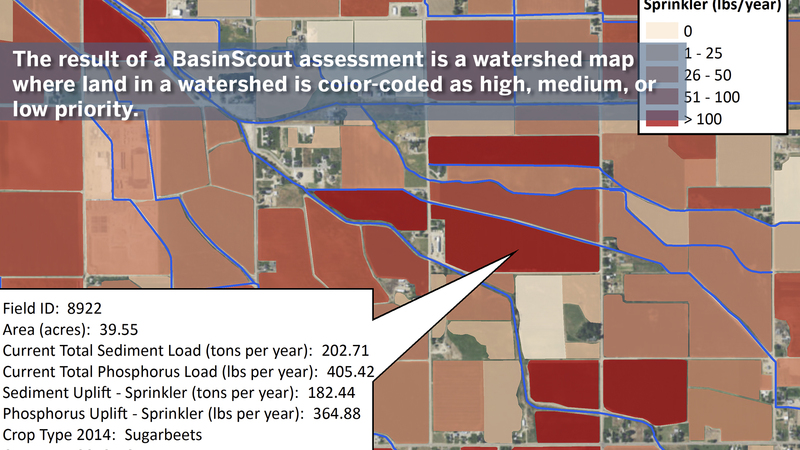 The result of a BasinScout assessment is a watershed map where land in a watershed is color-coded as high, medium, or low priority. The highest priority areas are identified as the places with the most potential to have an impact on water quality or quantity. A house cannot be built without a blueprint. BasinScout is a blueprint for building an effective restoration or conservation program. Once we understand the lay of the land, our Dynamic Implementation Environment Tool (DIET) comes into play. DIET is an adaptive management tool that can be used to identify and prioritize potential project sites for conservation actions based on environmental goals, recruitment, and cost constraints. If you think of BasinScout as a map laying out all the restoration or conservation opportunities in a watershed, DIET is the tool that takes the prioritization process a step further. Based upon goals, costs and timeline, the tool identifies the sites where action would make the most sense under a given set of real-world conditions. It allows us to actually see if it’s possible to achieve our goals for the natural resource with the financial resources available. Since 2012, we’ve contracted with the city of Medford to offset the temperature impacts of the 17 millions of gallons of warm water discharged into the Rogue River by the wastewater treatment plant by working with key landowners to plant trees and generate shade. 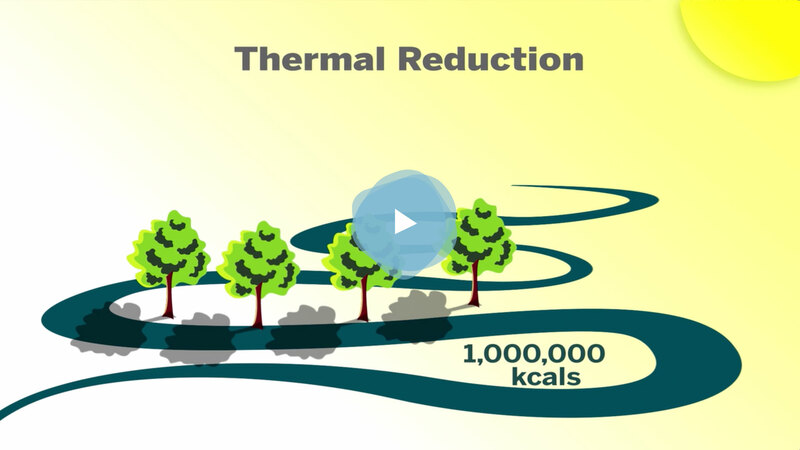 The amount of sun blocked by tree canopy is translated into thermal credits and tracked in kilocalories. A kilocalorie represents the amount of energy required to raise the temperature of a liter of water by 1.0 degree Celsius. One credit equals one kilocalorie per day, and TFT was tasked with generating 600 million through restoration. To ensure we could meet the restoration goal, we used DIET to evaluate the shade benefit and cost of implementation for each potential site. We were then able to play out different scenarios, discerning the best sites to plant to meet the kilocalorie obligation efficiently and cost effectively. To date, 30 acres have been strategically planted with native plants such as Ponderosa Pine, Black Cottonwood, Big Leaf Maple, Oregon Ash and White Alder. Similarly, we’re working with Idaho Power Company (IPC) to mitigate the thermal impacts of their Hells Canyon Dam Complex. Planting native vegetation along key tributaries to the Snake River, collaborating with irrigators to reduce agricultural runoff, enhancing floodplains and wetlands along the river bank and existing islands, and even creating new islands in the Snake River are all part of the proposed stewardship plan for the Snake River watershed. 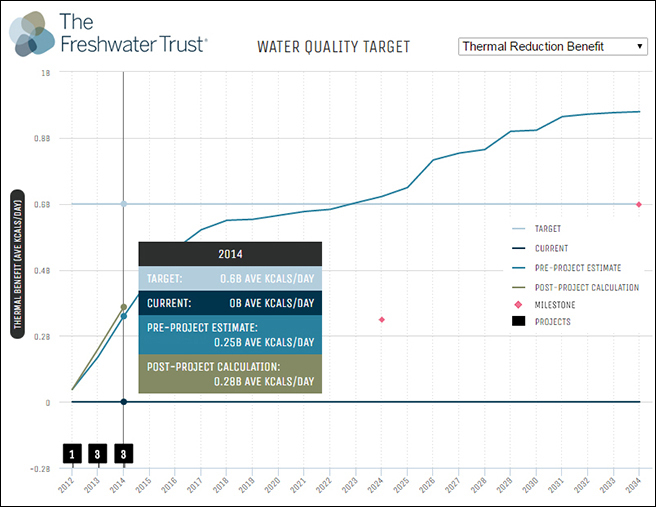 Idaho Power had confidence in moving forward with The Freshwater Trust’s watershed solution because we have the tools to quantify, evaluate, and track our actions. New doors opened through innovation and insight. We don’t want to go forward with a restoration or conservation project hoping it will have a benefit. We want to know it is having a benefit. We were inspired to develop a 21st century way to collect imperative data from the field for long-term analysis and reporting. 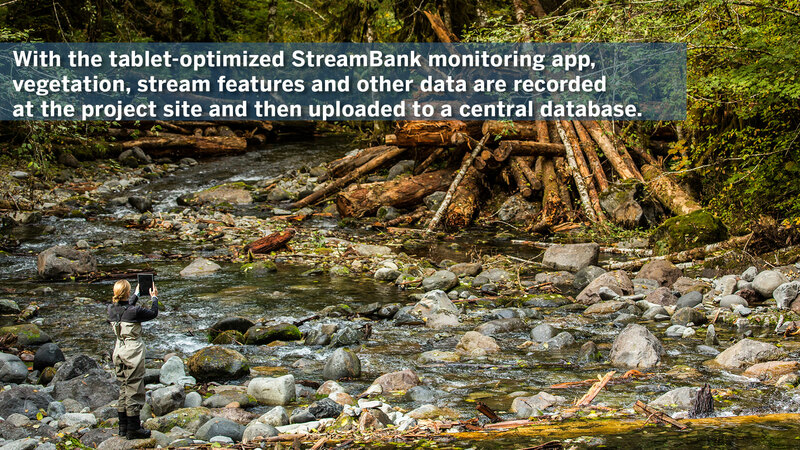 With the tablet-optimized StreamBank monitoring app, vegetation, stream features and other data are recorded at the project site and then uploaded to a central database. No transcription required. By retiring our field notebooks we’ve eliminated the intermediate step of data entry and added validation rules, which has been improving the quality of the data we are collecting. Regular monitoring allows us to ensure that project site goals are met and compare site status to performance objectives year after year. In the Sandy River Basin, where we’ve implemented restoration projects for more than a decade, we’ve compiled a collection of data documenting exactly how the reintroduction of large wood, side channels, and native vegetation has improved native fish habitat. In 2016, the Salmon River broke a record for the greatest number of steelhead spawners, 68 redds per mile, on a two-mile restoration reach. For the fourth consecutive year, the number of winter steelhead spawning in the upper Sandy basin was more than 350% of that when they were listed as a threatened species in 1998. Spring Chinook counts were also up, at 40 redds per mile. That’s more than 200% the long-term average. We have confidence in these numbers because we’ve monitored the project diligently for more than 10 years. In 2011, the StreamBank Toolkit received a U.S. patent. Together, these tools are integral to carrying out our mission – ensuring investments and actions are strategic and effective and ultimately, a future with clean, healthy freshwater is realized on a timeline that matters to us all.